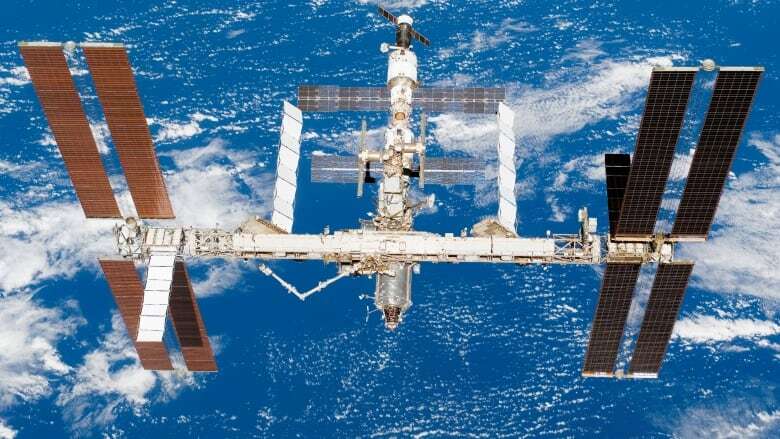 The six astronauts aboard the International Space Station worked to fix a hole found in the wall of the International Space Station. Six astronauts worked to fix a leak in the wall of the International Space Station. The problem was first detected by mission control Wednesday night as a reduction of pressure in the station, but it was small enough that the crew was allowed to sleep all night, NASA reported. The leak came from a two-millimetre hole in the orbital compartment of the Soyuz MS-09 spacecraft in the Russian segment. This section does not return to Earth. The hole was likely caused by a micrometeorite or orbital debris hitting the space station. As of Thursday afternoon, NASA reported that cabin pressure was holding steady. Flight controllers in Moscow worked with the crew to repair the hole with an epoxy gauze wipe. They also raised the cabin pressure in the station using the Progress 70 cargo ship's supply of oxygen. Meanwhile, flight controllers in Houston continue to monitor the situation. European Space Agency astronaut Alexander Gerst reportedly put his finger over the hole initially. "In effect, he literally touched space without a space suit," tweeted the YouTube channel Techniques Spatiale. En effet, <a href="https://twitter.com/Astro_Alex?ref_src=twsrc%5Etfw">@Astro_Alex</a> a mis son doigt pour boucher le trou en attendant, et ils ont du matos spécialement conçu pour colmater définitivement. Alex aura littéralement touché l'espace, sans combinaison ! The Russian space agency, Roscosmos, has created a commission that will investigate the cause of the leak. Russian ground controllers say they are now into a deep dive evaluation of the hole. Sergey Prokopyev is still trying to hunt down a repair kit. They have taped the hole as a band aid. Plan is to clean up the area and add more permanent patches. ISS Leak: Now told to use a toothpick on the hole (likely to aid photography and scale). Then will apply sealant and cover it with a patch. General ISS pressure is holding stable now.<br><br>No emergency and a repair plan. The European Space Agency reported crew members are in no danger, as there are weeks of air left in the ISS reserves. Drew Feustel, the current commander, and Ricky Arnold and Serena Auñón-Chancellor, all from the U.S.
Oleg Artemyev and Sergey Prokopyev of Roscosmos, both from Russia.